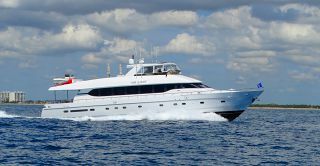 Luke Brown Yacht Sales, the new boat division of Luke Brown Associates, has announced the completion of the third build in the new Nordic Tugs 40 series. The new vessel shipped from Nordic Tugs on September 12 and arrived in Fort Lauderdale on September 26, 2016. She was delivered to her new owner on October 4. 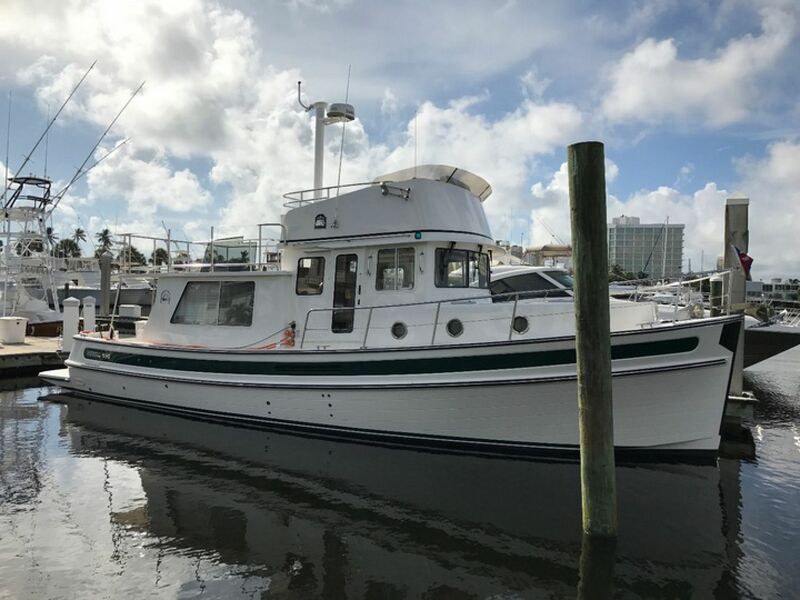 The boat completed her first passage from Fort Lauderdale through the Okeechobee Waterway to the west coast of Florida and arrived in her new home on October 10. NORDIC TUGS 40-003 NEARS COMPLETION IN BURLINGTON, WASHINGTON IN MID-AUGUST, 2016. NT40-003 has many unique features, but one that sets her apart is the installation of a new Seakeeper stabilization system. 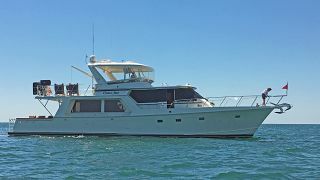 During the sea trials on this boat, the Seakeeper impressed everyone on board, said Rick Kellogg, Warranty and Service Manager for Luke Brown. "The Nordic Tug is noted for its stability, due to its uniquely designed hull. The Seakeeper turned this normally very stable boat into a stationary platform with much less movement underway." 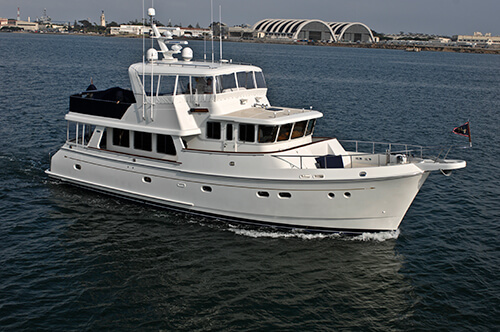 UNDERGOING FINAL ENGINE TESTING IN BURLINGTON PRIOR TO HER FIRST SEA TRIAL IN ANACORTES, WASHINGTON.One of her unique features is her variable speed bow and stern thrusters, which give her complete joystick like control. 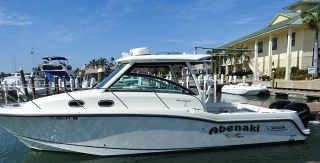 This feature will adjust and hold the boat on the dock, while she is secured. 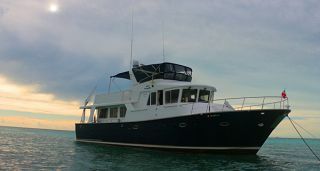 NT40-003 ARRIVING IN FORT LAUDERDALE ON SEPTEMBER 26 IN ALMOST PERFECT CONDITION. 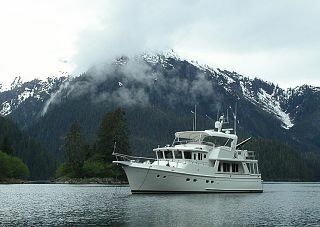 Jim Wilkey, Luke Brown Yachts’ Nordic Tugs product manager indicated that the boat arrived in almost perfect condition. “Nordic Tugs clearly has their act together on this build! 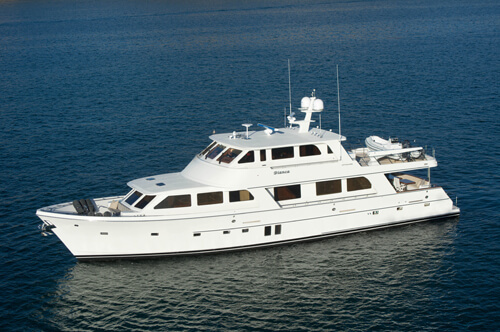 I’ve also had this confirmed by Ben Wilde, President of Wilde Yacht Sales in Essex, Connecticut,” said Jim. “Ben told me that his last two Nordic Tugs arrived in Connecticut also in excellent condition, so our expectations were very high,” Jim noted. THE NEW NORDIC TUGS MODEL 40 ARRIVING IN FORT LAUDERDALE, PROTECTIVE HULL COVERING IN PLACE. 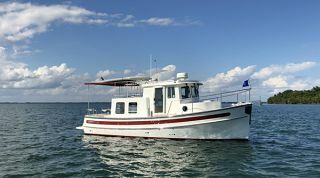 "This new Model 40, along with its sister, the Model 44, are milestones for us, because it's a strong indication that Nordic Tugs, after weathering the 2008 financial contraction, are back building the quality boats we all expect from them. Nordic Tugs quality is one of the main reasons that we wanted to be the Southeastern Regional Authorized Dealer for the product. 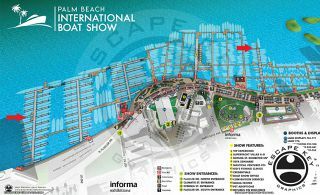 We'll have the Nordic Tugs 44 at the Fort Laudedale International Boat Show along with a brand new Nordic Tugs 26. They'll be located on the Bahia Mar B dock. We're pretty excited about having both boats in the show." Jim Wilkey indicated. THE NEW NORDIC TUGS 40, FLY BRIDGE INSTALLED AND READY TO GO, AT BAHIA MAR IN FORT LAUDERDALE, FLORIDA. 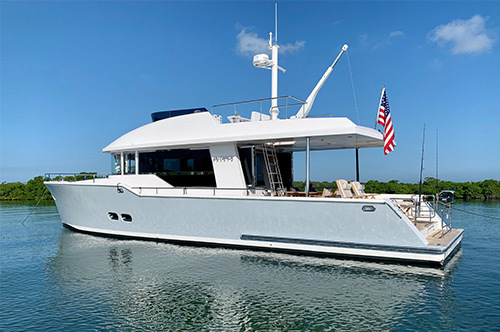 "I believe the clients are going to love some of the new features on the model 40, such as the new extended trunk over the focsile, which provides full ceiling height in the master stateroom and a great place to sun bath on the foredeck, the 2' extension to the cockpit, the newly designed and enlarged swim platform, a new starboard side boarding door in the cockpit, the double salon sliding door, the new ladder giving easier access to the sun deck and the split anchor locker with storage and easy access through two hatches on the foredeck," said Jim. READY FOR HER BUYER ON A BEAUTIFUL DAY IN FORT LAUDERDALE, FLORIDA. NOTE THE NEW EXTENDED TRUNK OVER THE FOCSILE. 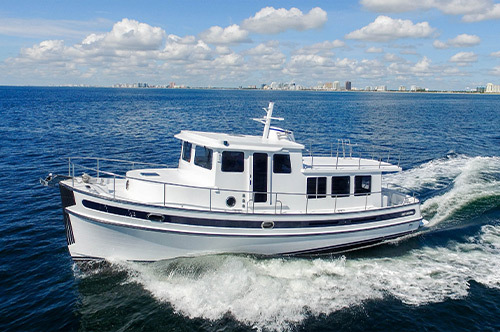 "This new Nordic Tug 40 really impressed everyone. 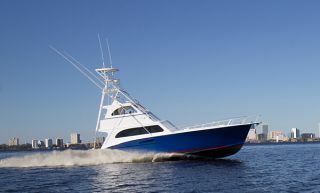 It took our staff about a week to commission, install the fly bridge and complete the sea trials with Volvo, Garmin and Seakeeper, " Andrew Cilla, President of Luke Brown, said. "It's about as perfect a new build as I've seen in my 44 years in the buisiness!"